Our totally inflatable Laser Tag is the perfect way to let your inner James Bond out! Hide around corners, secret agent your way through the obstacles; just whatever you do don’t get hit! For hours of team play and comradery, this is sure to be a “Run… Home Run”! Using our POPCORN machine or SNOW CONE maker would be a great way to spend time in between rounds! 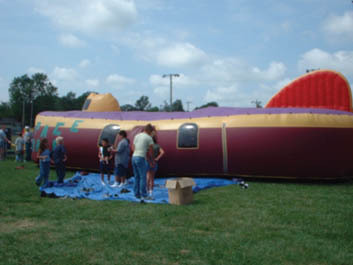 You may also be interested in our WATER TAG inflatable or SPACE CRAWL Even though our business is fun, we take safety seriously. Fun Service staff is fully insured and licensed. So, you can expect to receive quality, professional service with every rental from Fun Service of Nebraska and Iowa.